Planes, trains, and automobiles. Cruise ships too. 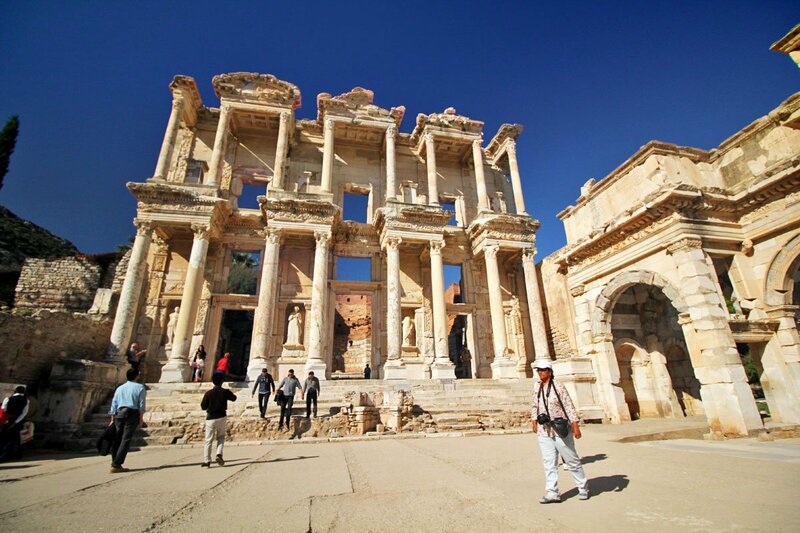 With busloads of tourists swarming to Ephesus every spring, summer, and fall, I’m glad we decided to visit in November. 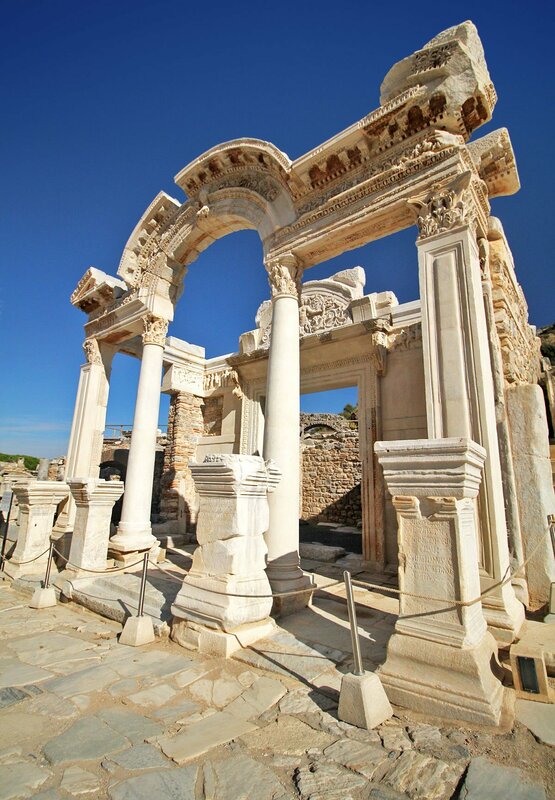 Thanks to its reputation as one of the most well-preserved Roman ruins in the world, Ephesus ranks among Turkey’s most popular tourist destinations, attracting over 2 million visitors annually. Spring and Autumn are its busiest while in the summer, tourists come by the boatful. It isn’t hard to see why. 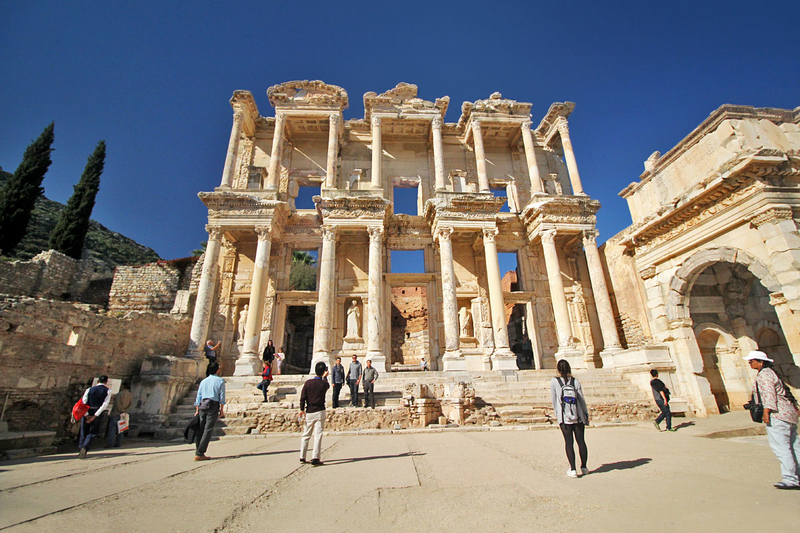 Once the third largest city in Roman Asia Minor and its most prominent seaport, much of Ephesus may lie in ruin today but the structures that are intact — like the Library of Celsus and the Great Theatre — will leave you in awe. They’re nothing short of magnificent and a reminder of the city’s former splendor. 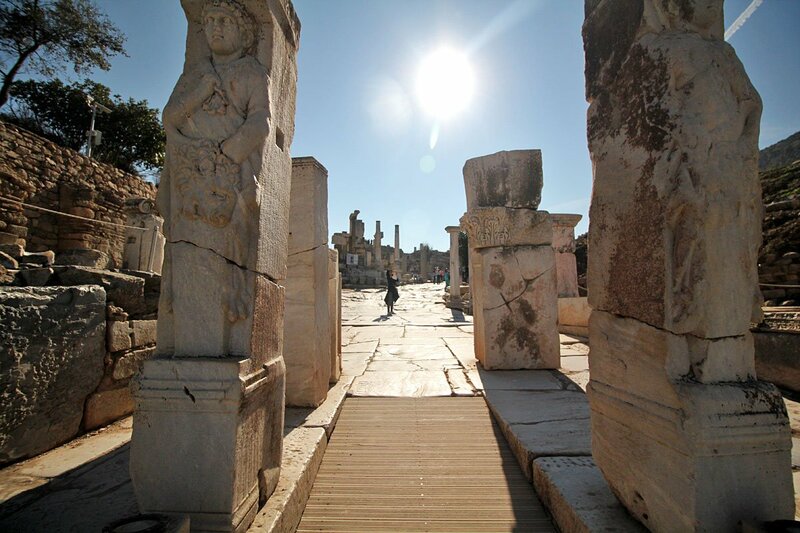 Also referred to as the south gate, this is where the taxi will drop you off after visiting Meryem Ana Evi. 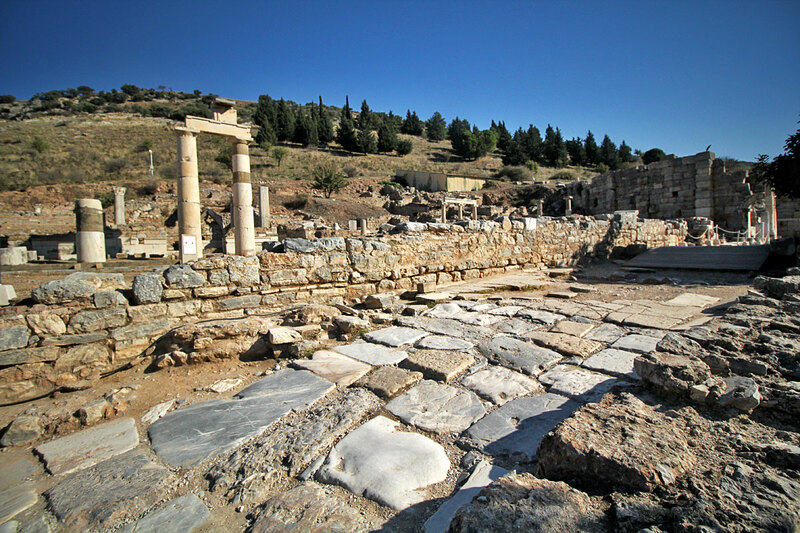 For reasons I’ll explain at the bottom of this post, it’s ideal to start here and make your way down to the north gate (Koressos). 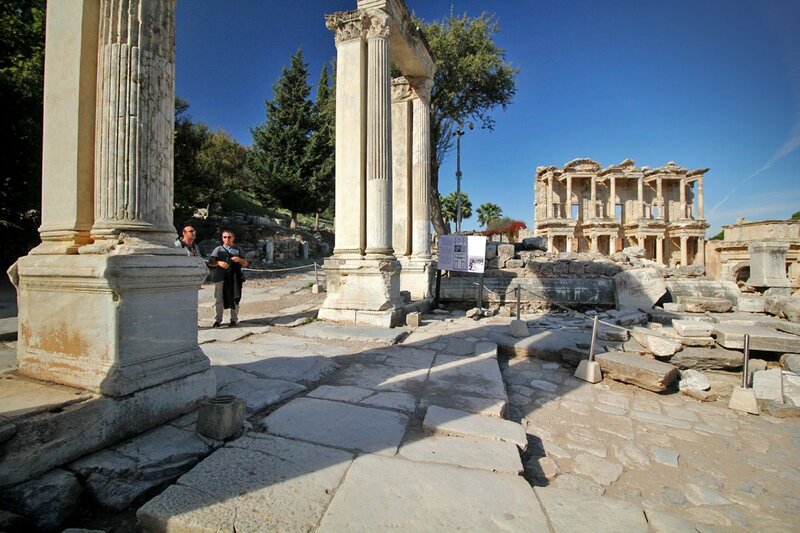 Entrance to Ephesus is 40TL and audio guides are available for an additional 20TL. This was the site of a former Roman basilica. Around a hundred and sixty meters long, it functioned as the stock exchange as well as a place to conduct business and legal proceedings. It was destroyed by an earthquake in the middle of the 4th century AD. 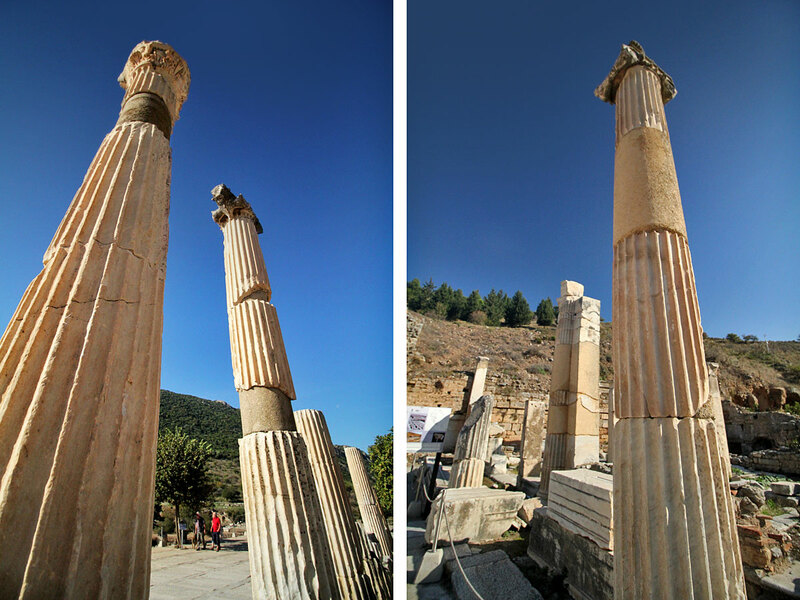 Adorned with bull’s head carvings, these massive columns date back to the 1st century AD. The thought that many of these structures have been around since the time of Christ was mind-blowing. 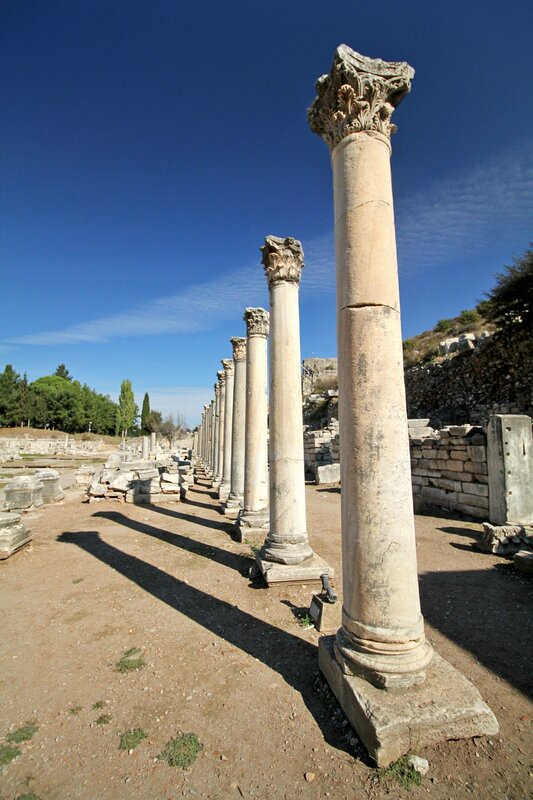 Erected in the 1st century AD, these columns may be ancient to us, but they’re young by Ephesus standards. 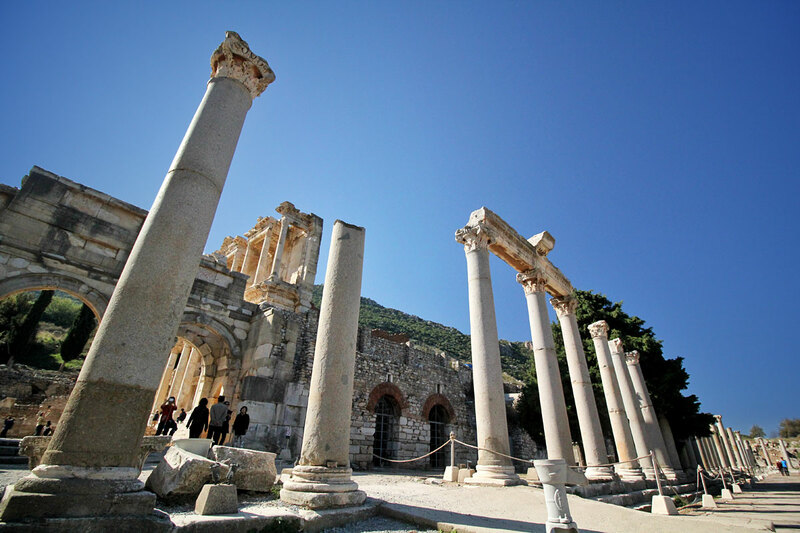 Ephesus was built in the 10th century BC by Greek colonists. WOW. This monument was built in the 1st century AD by Memmius, the grandson of dictator Sulla. Hailed as a Roman hero, Sulla was responsible for quelling the revolution of Mithridates the Great and restoring Roman control in Ephesus. This monument was built to commemorate that victory. Standing towards the end of Curetes Street, this gate was brought here in the 4th century AD to prevent the passage of vehicles and create a pedestrian area. It depicts Hercules carrying the skin of the slain Nemean lion. In Greek mythology, the Nemean lion was a vicious monster with claws sharper than swords and skin so thick that it was impervious to mortal weapons. Hercules wrestled the lion to the ground and killed it by thrusting his arm down its throat and choking it to death. 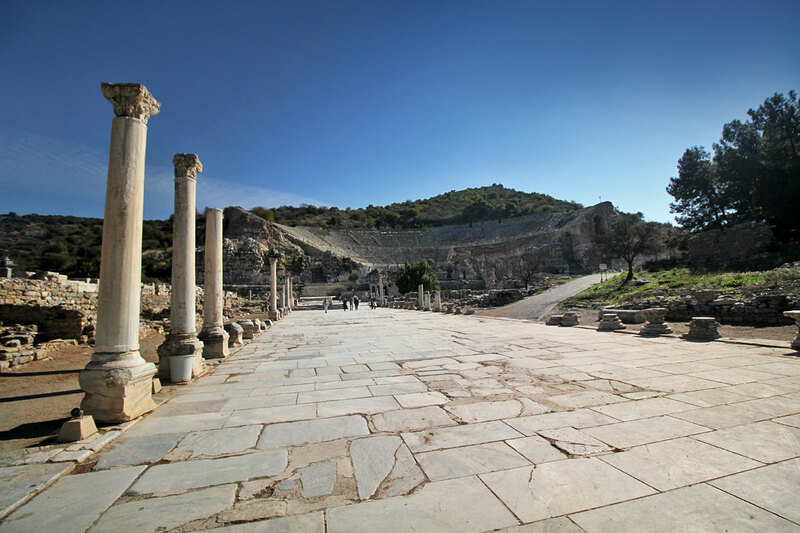 Between the Hercules Gate and the Library of Celsus, Curetes Street is one of the three main streets in Ephesus. On either side of the street once stood fountains, monuments, statues, and shops. 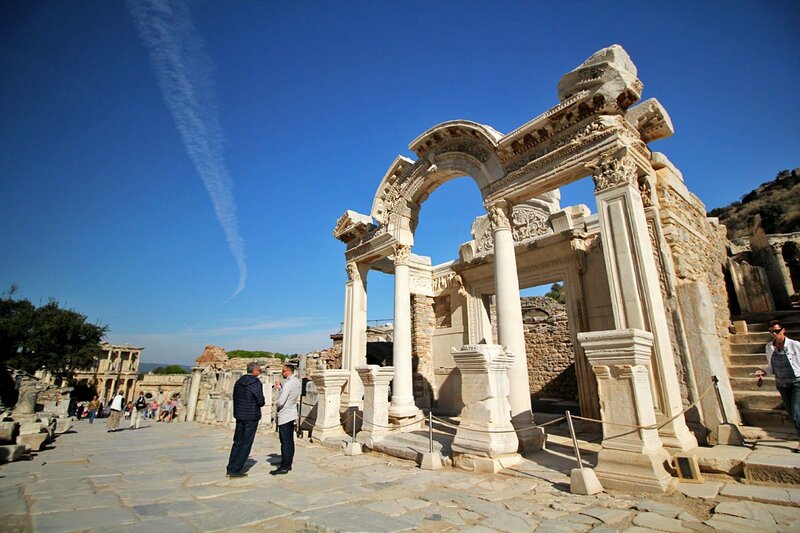 Regarded as one of the finest monuments in Ephesus, this fountain was built in honor of Emperor Trajan in 104 AD. The fountain’s pool was surrounded by statues of Dionysus, Satyr, Aphrodite, and members of the Emperor’s family. The statues are now on display at the Ephesus Museum. 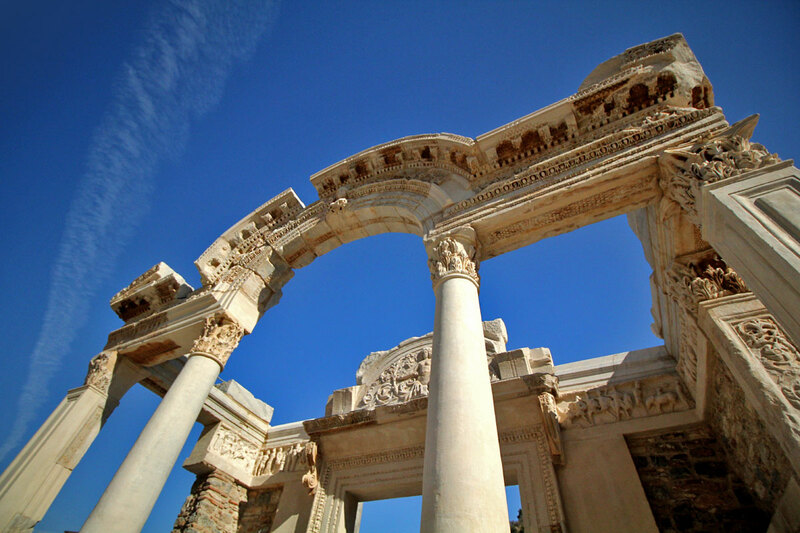 One of the most impressive and best-preserved structures in Ephesus, the Temple of Hadrian was built in 118 AD to honor Emperor Hadrian. The facade of the temple has four Corinthian columns supporting a curved arch, in the middle of which contains a relief of Tyche, the goddess of victory. Notice the empty pedestals? They were once the bases for statues of Diocletian, Maximian, Constantius I, and Galerius — emperors who ruled between 293 and 305 AD. The original statues have not been found yet. 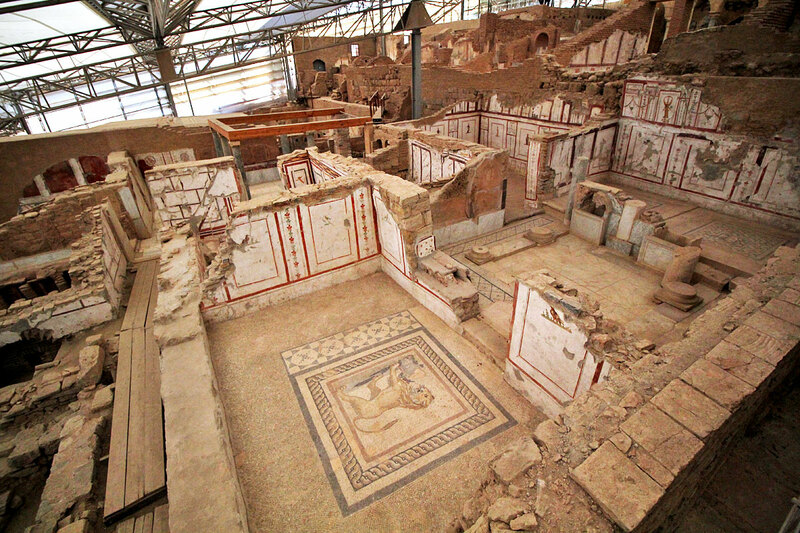 Inside the temple above the door is a human figure, believed to be Medusa standing with ornaments of acanthus leaves. On both sides are friezes depicting the history of Ephesus — Androklos shooting a boar, Dionysus in ceremonial procession, and the Amazons. These friezes are reproductions. 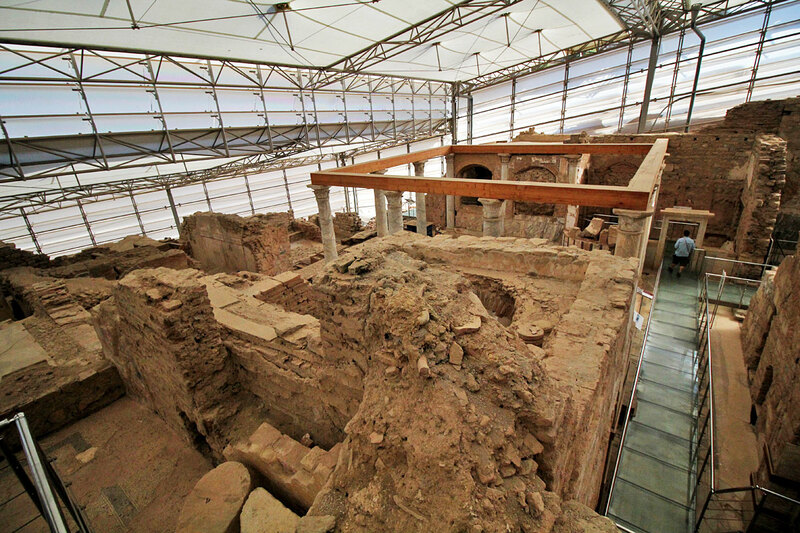 The originals are on display at Ephesus Museum. 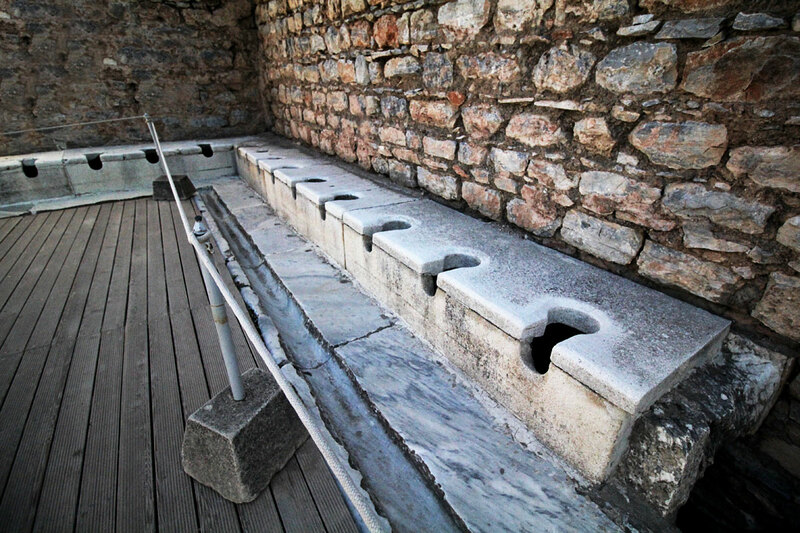 Public toilets that people back then could use for a fee. Pass the papyrus please. This was pretty cool. For an additional 20TL, you can walk through the covered Terrace Houses, also known as “The Houses of the Rich.” It gives you a good glimpse of how affluent people at the time lived. Like pieces to an impossible jigsaw puzzle. Wooden boards with stone fragments like these were all over the Terrace Houses. Can you imagine trying to piece these together? C’est impossible! Protected by a roof, the Terrace Houses are comprised of six residential units on three terraces. 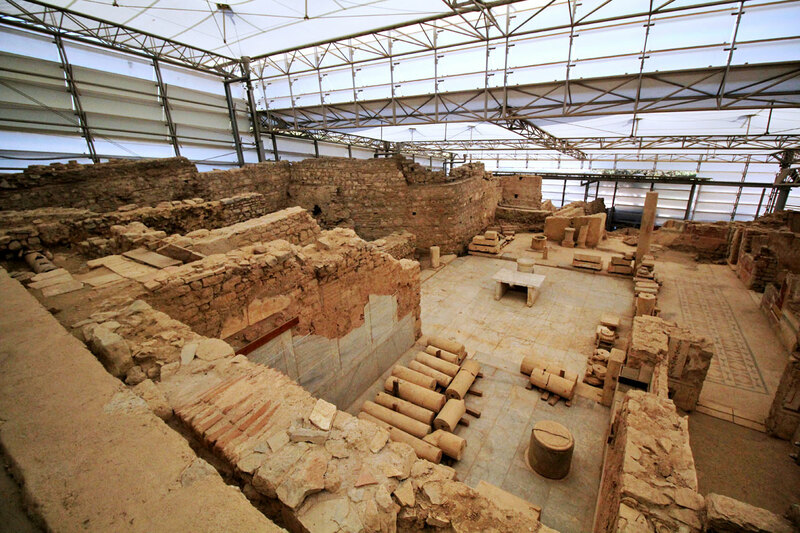 The oldest building dates back to the 1st century BC and was in use until the 7th century AD. Not sure what those cylindrical things are. Remnants of columns maybe? On the ground floor were living and dining areas. Bedrooms and guest rooms were upstairs. Beautiful mosaics. This was the highlight of the Terrace Houses. Ancient engineering. 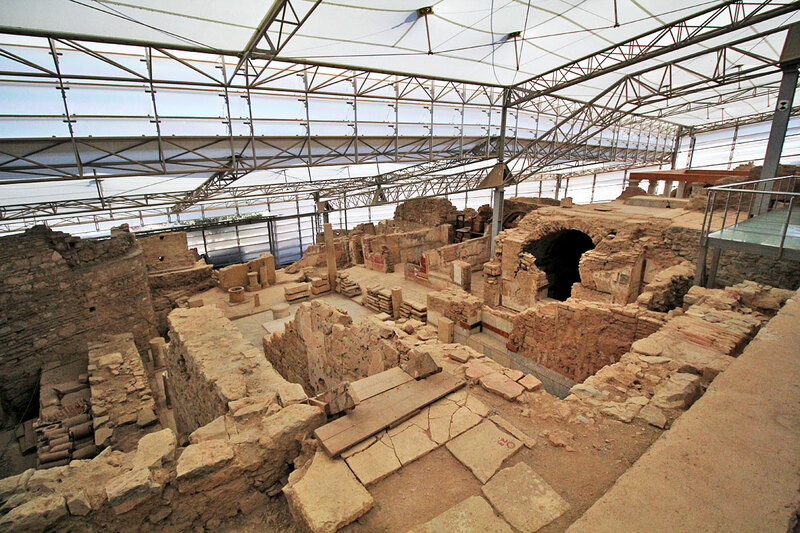 Can you believe that this ancient structure was built with a heating system? Clay pipes beneath the floors and behind the walls carried warm air through the houses. The houses also had the luxury of hot and cold water. A short video I took to help you better appreciate the space. Exiting the Terrace Houses and making our way back down the hill, the most iconic and beautiful structure at Ephesus comes into view. 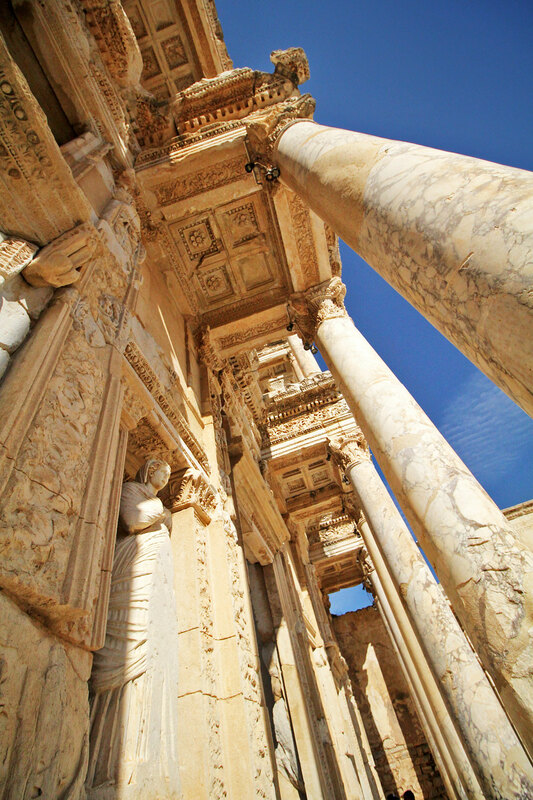 Constructed in 117 AD, the Library of Celsus was a monumental tomb built in honor of Roman Senator Tiberius Julius Celsus Polemaeanus by his son Gaius Julius Aquila. Serving as a mausoleum over the crypt, the library was designed to store 12,000 scrolls and was the third richest in ancient times, after the libraries in Alexandra and Pergamum. 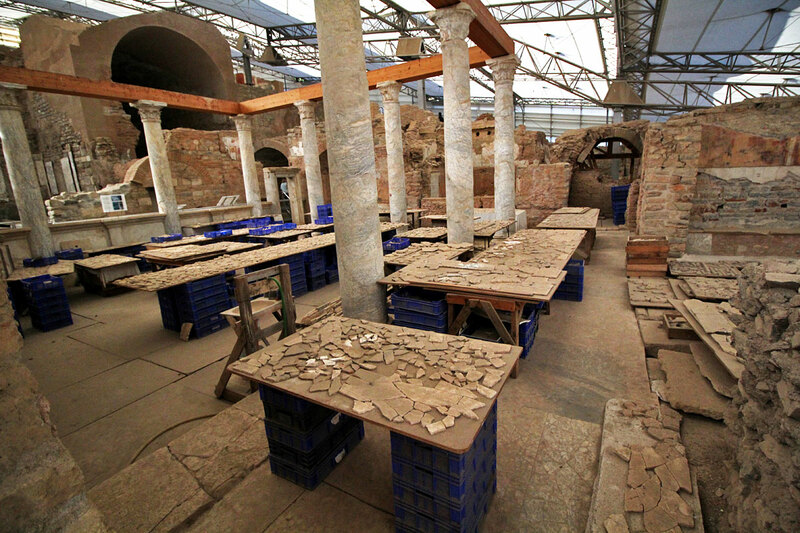 The interior of the library was said to have been destroyed by an earthquake in 262 AD, and the façade by another earthquake in the 10th or 11th century AD. It lay in ruin for centuries before the facade was restored by archaeologists between 1970 and 1978. 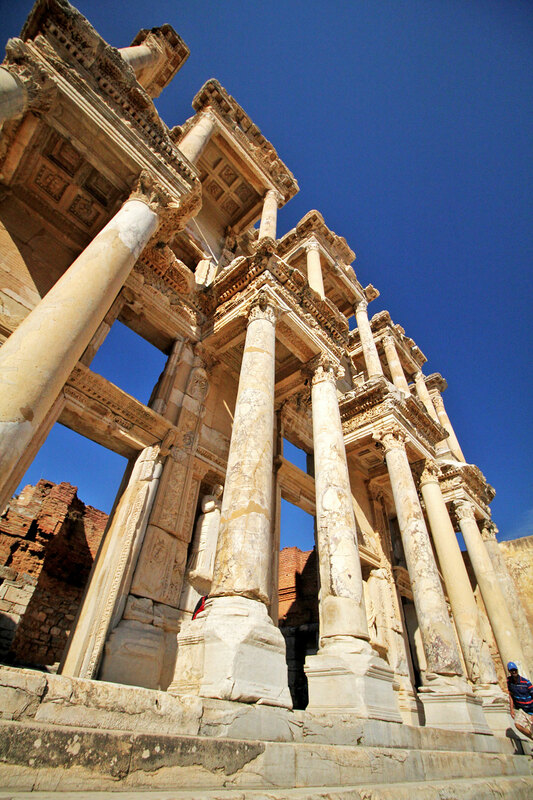 I don’t think Ephesus would have the appeal that it does today if it weren’t for this magnificent structure. The facade of the library has two-stories, with Corinthian-style columns on the ground floor and three entrances to the building. The statues in the column niches are of Sophia, Episteme, Ennoia, and Arete. Extolled as the virtues of Celsus, they symbolize wisdom, knowledge, intelligence, and valor. 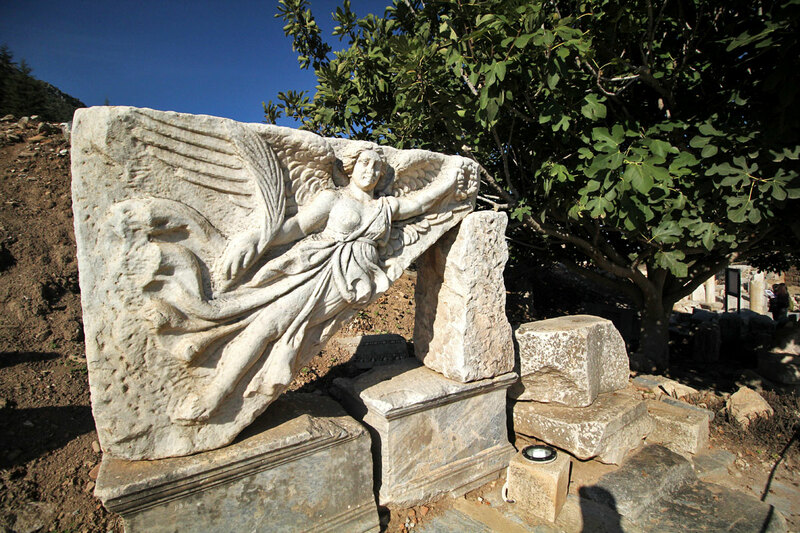 These statues are reproductions; the originals are on display at Ephesus Museum. 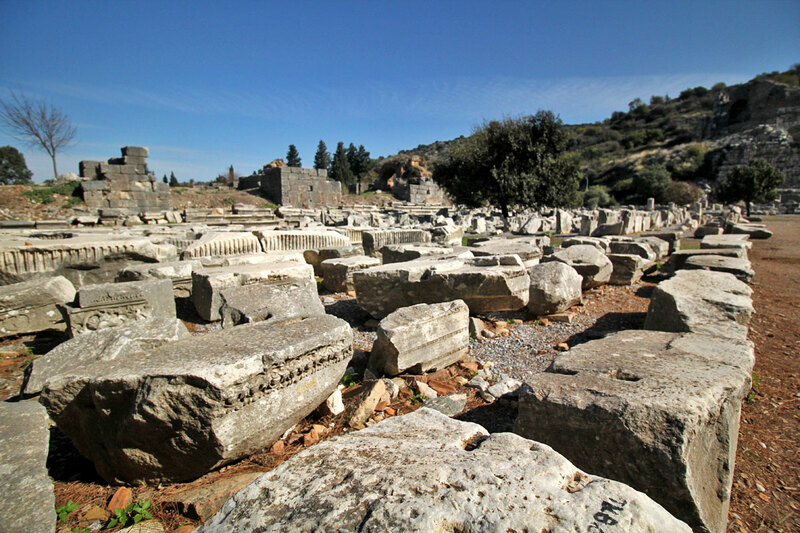 Meaning “gathering place” or “assembly”, the agora was the center of any Greek city-state’s athletic, artistic, spiritual, and political life. Situated between the Harbour Baths and Great Theatre, traders and sailors would arrive on this street upon entering the port. 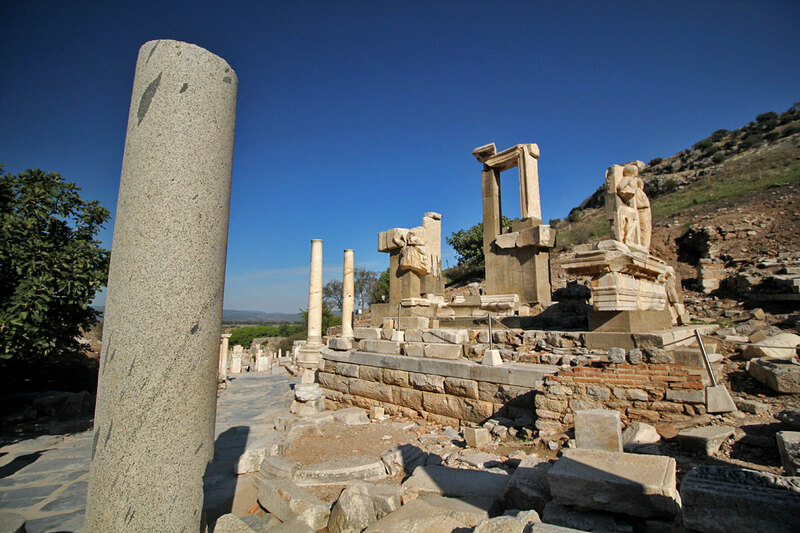 Once a thriving seaport thanks to its access to the Aegean Coast, Ephesus fell from prominence after the harbour silted up and the coast moved further west. Walking up Arcadian Street, what a monumental sight the Great Theatre must have been. 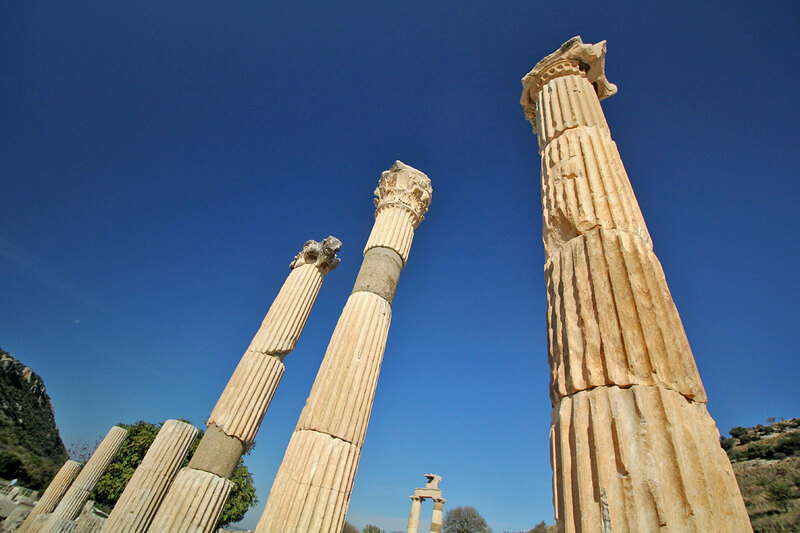 First constructed in the 3rd century BC, it was enlarged during the Roman Period and formed to its present style. 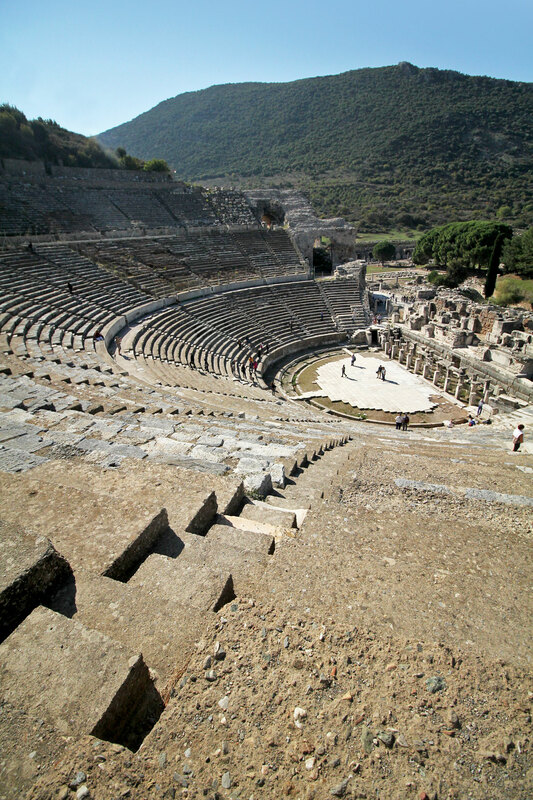 It’s the largest theatre in Anatolia with a seating capacity of 25,000. “Are you not entertained? !” Resplendent isn’t it? The cavea (seating sections) has sixty-six rows of seats divided by two diazoma (walkway between seats) into three horizontal sections. In the lower section was the Emperor’s box. Any seats with backs and made of marble were reserved for important spectators. The Theatre Gymnasium, or what’s left of it. This pile of rubble once contained lobbies, warm bathing pools, a frigidarium, recreation rooms, and halls for training. 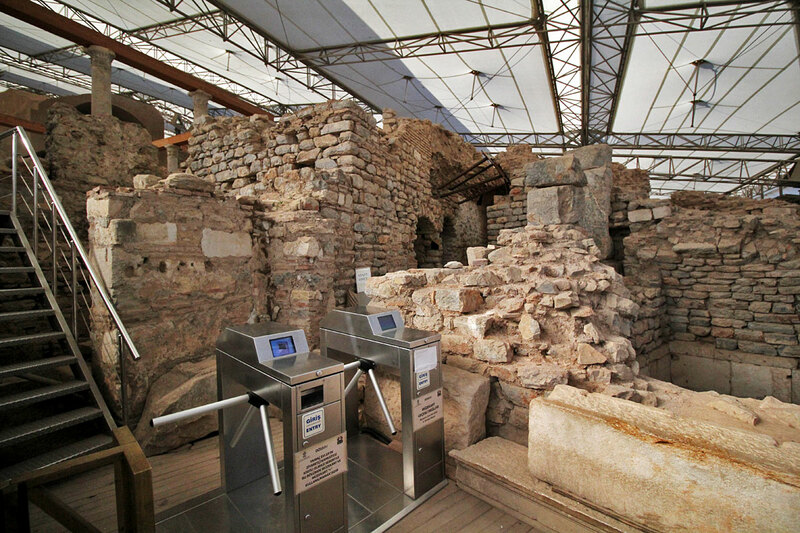 Though little more than a pile of rubble now, the Church of Mary is of great historical significance because the Council of Ephesus is believed to have been held here in 431 AD. During the council, it was discussed if the Virgin Mary should be called Theotokos — “bearer of God” — or Christokos — “bearer of Christ”. Despite arguments that the former threatened the humanity of Christ and denigrated God’s greatness, the council ultimately decided in favor of the Theotokos title, which has been used for Mary ever since. 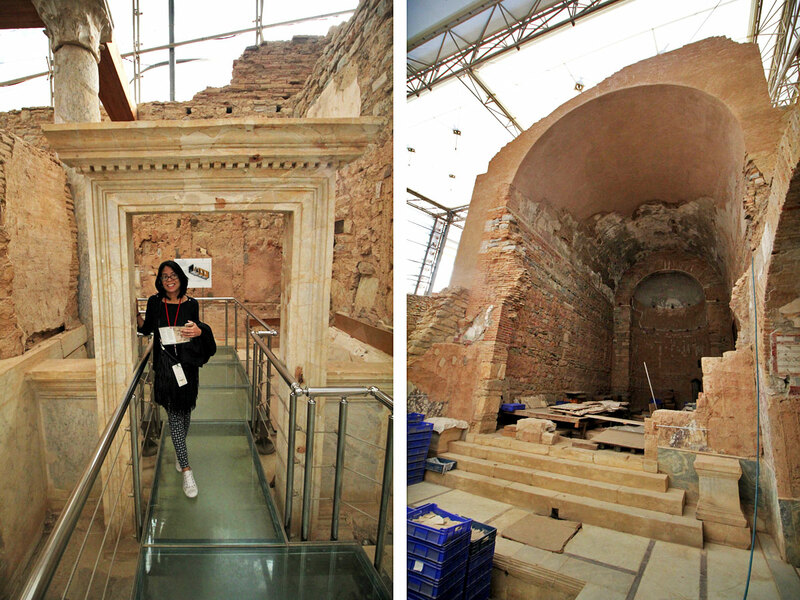 From the last two pictures above, you can see that much of Ephesus lies in ruin. 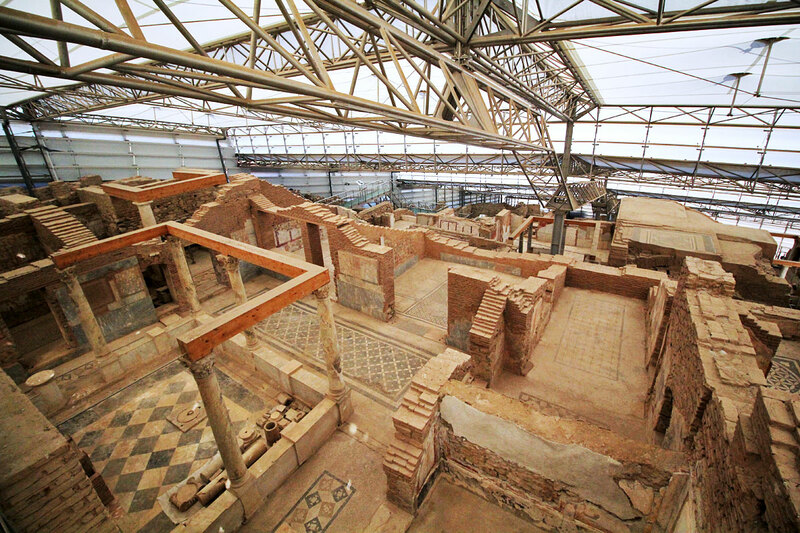 Though considered one of the most well-preserved Roman ruins in the world, much of it is in this state which may be disappointing for some. 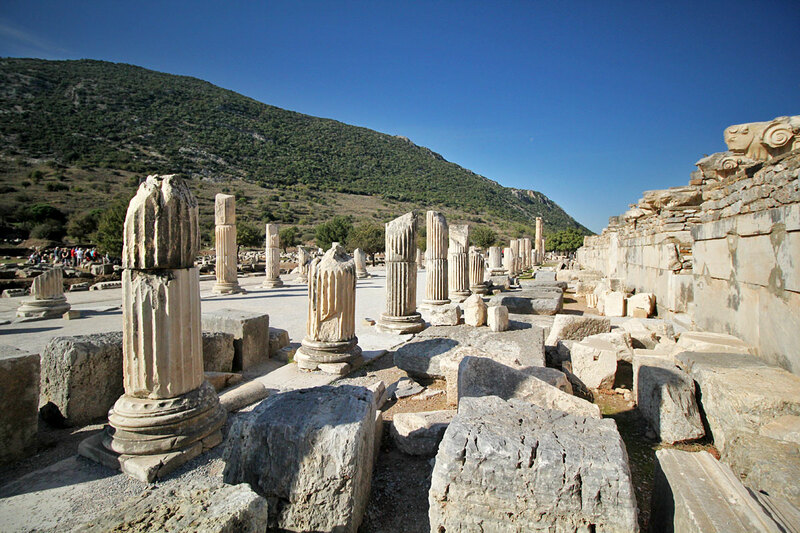 Only an estimated 25% of Ephesus has been excavated and not everyone can appreciate piles of old rocks. But that shouldn’t keep you from going. Because the structures that are standing will more than make up for it. 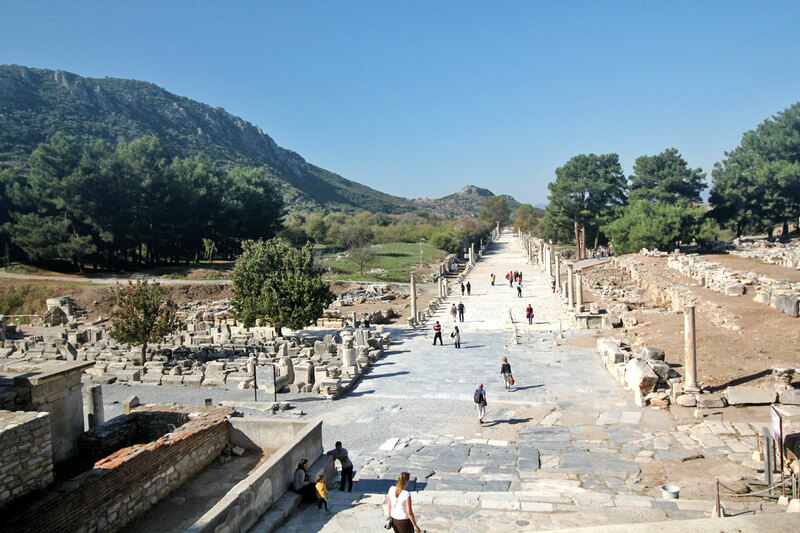 The steady stream of tourists flooding into Ephesus each and every year is a testament to that. 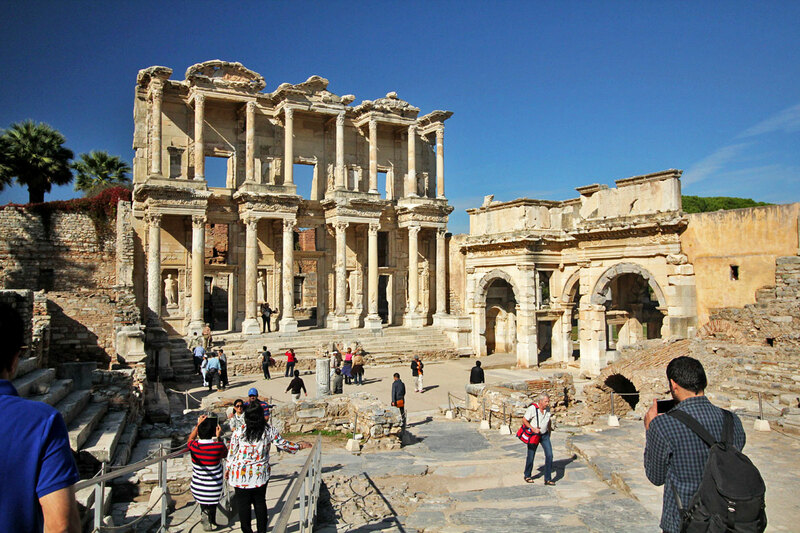 As described up top, Ephesus receives the majority of its visitors in spring, summer, and fall, so if you’re averse to crowds, then I suggest visiting in the winter. End of October and November is ideal. It isn’t very cold yet and crowds are thinner. I was perfectly fine walking around in a light sweater with just a t-shirt inside. 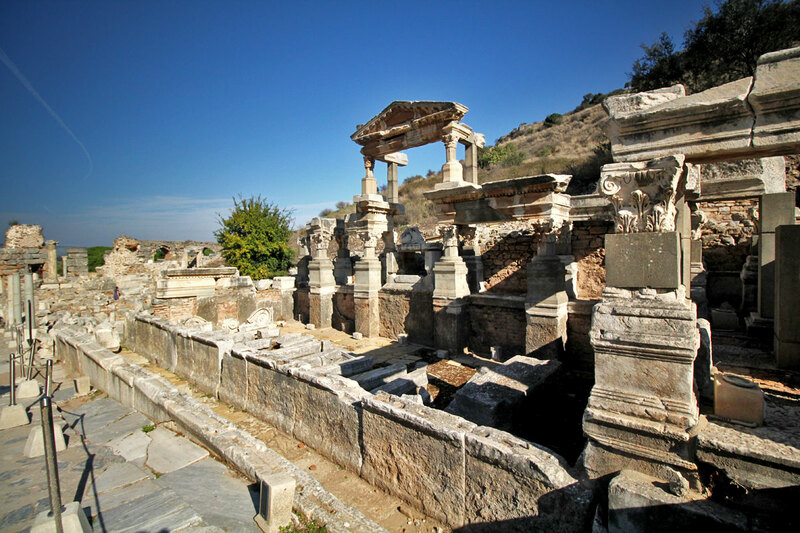 Around 3 km from Selçuk, you can either walk to Ephesus or catch a minibus from the otogar (bus station). 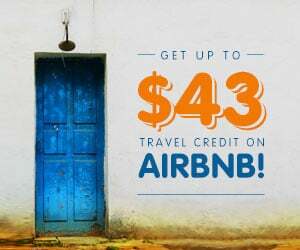 It will drop you off at the north gate (Koressos). From there, you’ll make your way to the south gate then back again to the north to either walk or catch a minibus back to town. 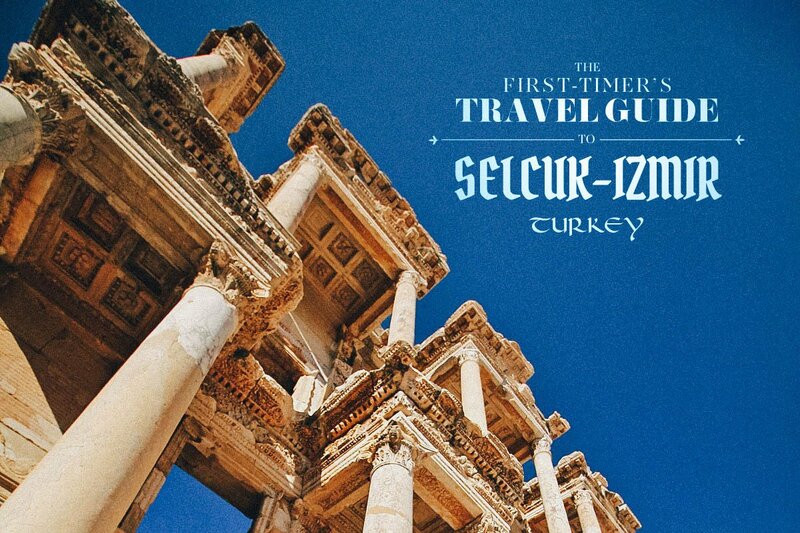 As far as I know, there are no minibuses to Selçuk from the south gate (Magnesia), which is why you’ll need to backtrack. If you’re planning on visiting Meryem Ana Evi, the better option would be to do that early in the morning before going to Ephesus. 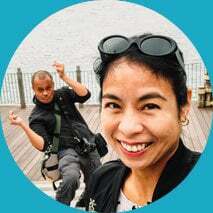 The south gate is on the way back to town so the taxi driver can drop you off there at no extra cost. 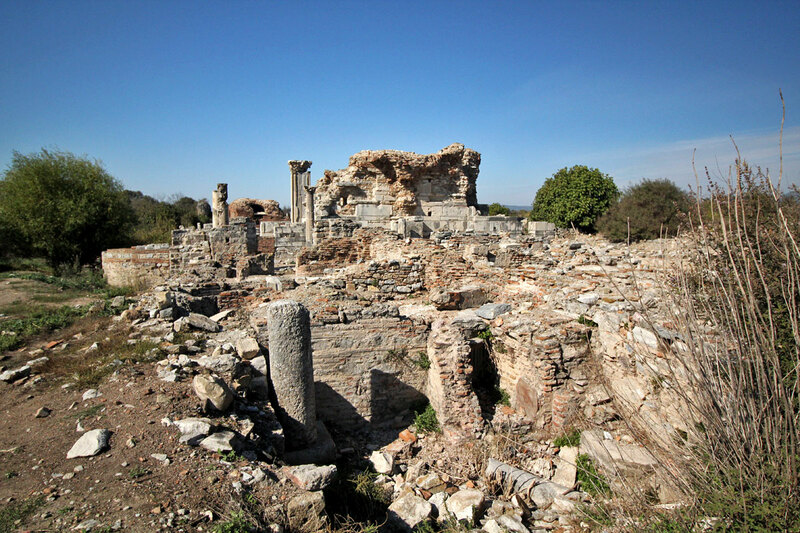 The archaeological site is about 3 km from Selçuk. You can either walk (30 mins) or take a minibus (3.50TL) from the otogar to the north gate. If you’re visiting Epehsus after a trip to Meryem Ana Evi, the taxi will drop you off at the south gate. 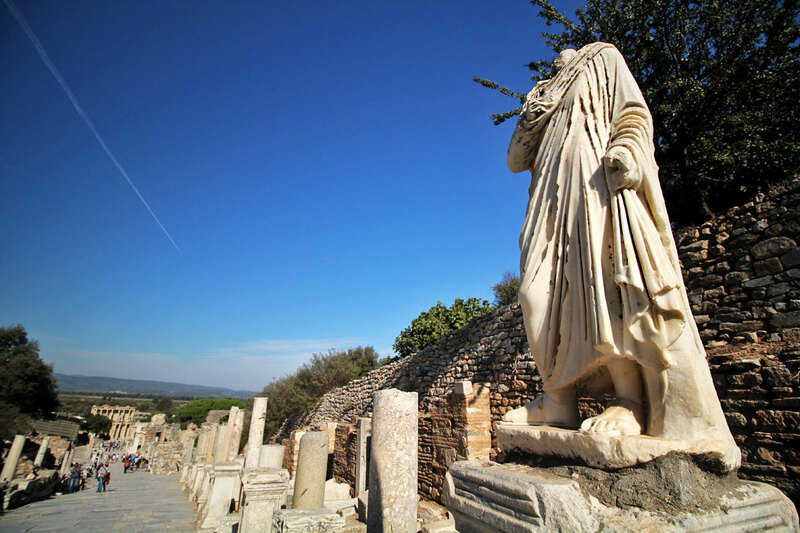 You’ll explore Ephesus, making your way from the south to the north gate, then either walk or ride a minibus back to Selçuk.